The intrapreneurial behavior of employees has become of strategic importance for the performance of organizations. However, the literature on intrapreneurship is dispersed and in need of an integrated overview of the characteristics and behaviors of intrapreneurial employees. Based on a systematic literature review, we propose a new definition of intrapreneurship that emphasizes its multilevel nature. Moreover, we propose a comprehensive model of intrapreneurship in which we integrate the new definition, dimensions, and determinants applicable to individual employees. We find that innovativeness, proactiveness, risk-taking, opportunity recognition / exploitation and internal / external networking are important behavioral dimensions of intrapreneurship. A certain skillset, a perception of their own capabilities, personal knowledge, past experience, the relation with the organization, motivation, satisfaction and intention are the determinants of intrapreneurial behavior that we derived from the literature review. Based on our results and an integrated model of intrapreneurship, we suggest a number of future research directions. Over the years, the role of employees in organizations has changed. Decision-making processes have become more decentralized and employees are gaining more discretion and responsibility (Foss et al. 2015). This trend goes hand in hand with employees being relied upon to be flexible, proactive and innovative (Giunipero et al. 2005). Rather than being passive recipients of changing jobs and products, employees need to adopt roles as “innovators” and “differentiators” (Bowen 2016). As such, they are expected to be able to adapt to and shape the (changing) business environment (Teece 2006), igniting new product or process ideas. They are expected to actively seek opportunities and take risks to introduce change (Ross 1987). More specifically, employees are increasingly required to adopt a more intrapreneurial way of working to deal with or even initiate these changing requirements and directly impact a firm’s strategic direction (Hart 1992; Peters and Waterman 1982). For example, Heinze and Weber (2016) found that intrapreneurial employees implement new logics in organizations by using opportunistic tactics, and leverage small changes to spark larger changes in the broader organization. In addition, Alt and Craig (2016) show that lower-level employees can induce bottom-up socially inspired innovations in for-profit organizations. Because of its strategic importance, there has been a plethora of research on intrapreneurship, including its antecedents, conditions, and consequences (Antoncic and Hisrich 2003; Ireland et al. 2009). It is generally assumed that intrapreneurship is a broad construct that encapsulates different sub-constructs, such as innovativeness or proactiveness, but there is less agreement about its definition. For example, Fischer (2011) defines intrapreneurship as a process of corporate renewal in established firms, whereas other researchers describe the concept as bottom-up, proactive work-related activities of individual employees who have the ability to turn ideas into business success (Moriano et al. 2014; Pinchot 1987). Moreover, there is no consensus about the dimensions of intrapreneurship or its determinants and conditions (Farrukh et al. 2017; Urban and Wood 2017). The conditions in which intrapreneurship is facilitated could serve as a basis for developing business practices, such as development and rewards, which would stimulate intrapreneurial behavior (Schmelter et al. 2010). Lastly, research on intrapreneurship is often limited to intrapreneurship as a characteristic of the organization. For instance, there are multiple studies focusing on the link between entrepreneurial orientation (EO) and the performance of the organization (Covin et al. 2006; Wiklund and Shepherd 2005). Entrepreneurial orientation is defined as the posture of an organization to be innovative, proactive and risk-taking (De Glercq et al. 2010). However, these studies focus on ‘climates’ of intrapreneurship, rather than the variation in characteristics and determinants of individual employee intrapreneurial behavior underlying the bottom-up process of implementing new ideas and innovations. More specifically, intrapreneurship is a bottom-up, multilevel construct that can affect different organizational levels (individual, team and organizational) (Antoncic and Hisrich 2003; Hayton and Kelley 2006; Kuratko et al. 2005). Behaviors of the intrapreneurial employees generate initiatives that can spiral up and impact the performance of teams (Fellnhofer et al. 2017; Kollmann et al. 2017) and organizations (Maritz 2010). Due to the dispersed nature of the literature, there is a need for an integrative framework that provides an overarching perspective on intrapreneurship and how intrapreneurship is facilitated. In our study, we conduct a Systematic Literature Review (SLR) to fill this need. First, we review the articles and analyze the definitions of intrapreneurship. Second, we review the results of the literature search and leverage the theory of planned behavior (TPB) to structure the determinants of entrepreneurial behavior. TPB argues that there are three antecedents to individual behavior, namely attitudes, behavioral control and subjective norms (Ajzen 1991; Mirjana et al. 2018). Attitudes are the degree to which a person has a favorable or unfavorable appraisal of entrepreneurial behavior (Tkachev and Kolvereid 1999, p.272). In addition to attitudes, the behavioral control a person perceives also influences behavior according to the TPB (Ajzen 1991; Karimi et al. 2017). The amount of control that someone perceives could be determined by certain characteristics of that person (Douglas and Fitzsimmons 2013). For instance, employees with intrapreneurial experience are more likely to show intrapreneurial behavior (Urbano et al. 2013). The perceived pressure to engage in intrapreneurial behavior, classified by the TPB as a subjective norm, is also seen as an antecedent for behavior (Jaen and Linan 2013). Therefore, we categorize the aspects of intrapreneurship of the employee into ‘behavior’, ‘attitudes’ and ‘characteristics’. Third, we analyze the outcomes of intrapreneurial behavior. Fourth, it is also important to investigate the conditions, e.g., organizational factors, that influence the behavior of the employee. Knight (1989) already mentioned that issues concerning operating within the boundaries of an organization, for instance lack of support and lack of corporate strategy, form a large obstacle for intrapreneurs. In addition, bureaucratization might form a threat to the ability of intrapreneurs to innovate (Jones and Butler 1992). We aim to answer the following questions: a) what is the definition of intrapreneurship and what are its dimensions? ; b) what are the determinants and outcomes of employee intrapreneurship? ; and c) what are the conditions influencing the impact of intrapreneurial behavior? Our contribution to the literature is twofold. First, we contribute to research that focuses on how and when employees perform beyond the call of duty. In recent years, a large number of studies have aimed to understand, for example, when employees help their colleagues (e.g., organizational citizenship behavior; see Dekas et al. 2013), when they communicate ideas, suggestions, concerns, information about problems, or opinions about work-related issues (employee voice; see Mowbray et al. 2015), or when they take initiatives to improve the meaning of their jobs (job crafting; see Wrzesniewski et al. 2013). Intrapreneurship entails a type of behavior that goes beyond expectations and impacts the course of the organization. Second, we provide a research agenda that identifies theoretical opportunities and methodological challenges for which further research on this topic is needed. For example, a possible research direction focuses on the interaction between different factors influencing intrapreneurship or the link between individual intrapreneurial behavior and organizational outcomes. This paper is structured as follows: The methodology section provides details about the search and selection of the articles used in this review. The results section is organized into four parts: (1) a descriptive analysis, (2) the analysis of the different definitions of intrapreneurship, and (3) the thematic results where the results of the analysis of the behavior, determinants, outcomes, and organizational conditions are analyzed. The integrative framework of intrapreneurship (4) is the final part of the results section. Lastly, the final section highlights the key findings and future research directions. A systematic literature review was conducted to define intrapreneurship, its dimensions, determinants, outcomes, and conditions. The steps to conducting a systematic literature review proposed by Tranfield et al. (2003) were used to select, extract and analyze the articles. These steps are: (1) identification of research, (2) selection of studies, (3) assessment of the quality of the papers, (4) data extraction and (5) data synthesis. The keywords that were used in this literature review are synonyms with intrapreneurship. We included entrepreneurial orientation in our search, even though it is not synonymous with intrapreneurship. 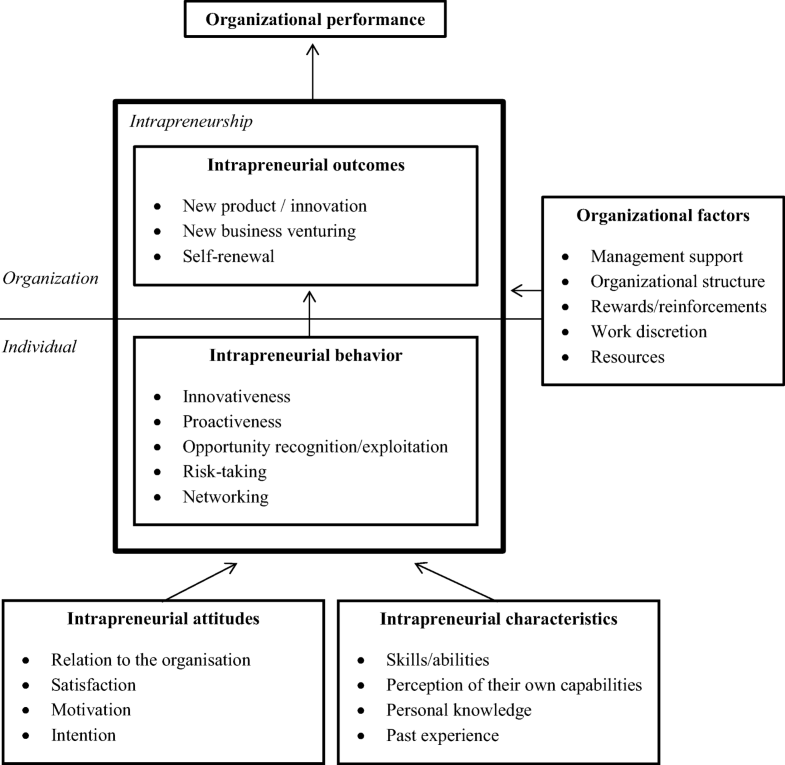 We did so because some authors use entrepreneurial orientation to describe individual intrapreneurship, for instance as individual entrepreneurial orientation (Fellnhofer 2017; Gupta et al. 2016). Furthermore, we did not include ‘internal corporate venturing’ in our search string. Adding this keyword did not increase the number of useful articles. The string of keywords was: “intrapreneur*” OR “corporate entrepreneur*” OR “entrepreneur* employee behavio?r” OR “professional entrepreneur*” OR “entrepreneur* orientation”. The keywords were connected using a Boolean logic, a method by which the database can search for certain keyword combinations, and the database searched for intrapreneurship in the keywords and the abstracts of the articles. 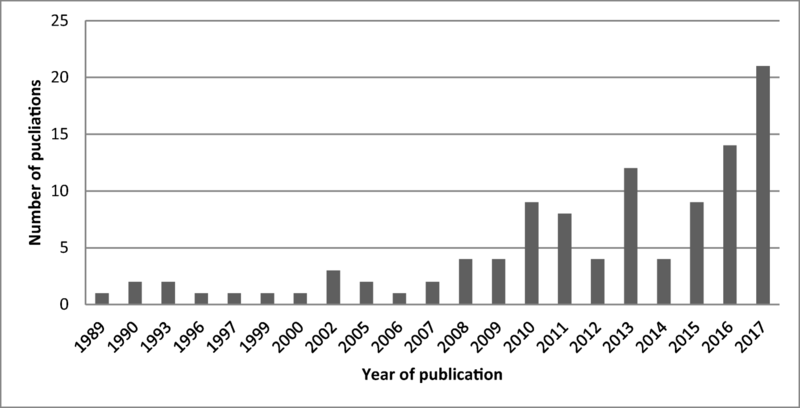 A search with these keywords using the online database Web of Science resulted in 1252 articles published from 1980 to 2017. This database was selected because of their coverage of articles that focus on management-related topics. During the orientation phase of this topic, we found that the term ‘intrapreneur’ was first used around the 1990s (Kuratko and Montagno 1989). Therefore, it is chosen to limit the search period from that moment to the end of 2017. We found 1252 contributions during the preliminary search, in which we included only peer-reviewed articles and articles written in English. Subsequently, the abstracts of these 1252 articles were analyzed to determine the focus of each article. The articles addressed intrapreneurship either as an organizational-level construct or an individual-level construct. For us to be able to answer the research questions, the articles were only included if they related this construct to individual employee characteristics. Articles that did not focus on the intrapreneurial employee were excluded. The excluded articles addressed either (1) corporate entrepreneurship on an organizational level, i.e., the organization as a whole acted entrepreneurially without addressing the individual employee, (2) the development of a new business within an existing organization, (3) the relationship between a parent company and its subsidiaries, (4) ‘pure’ entrepreneurs or CEOs, (5) the process of entrepreneurship in organizations, (6) family businesses or (7) conceptual papers based on the literature only. After this round, we were left with 245 articles. Another 25 articles were excluded from our analysis due to the full paper being unavailable in the public domain. The remaining 220 articles were included in a full paper check, in which the complete articles were read and analyzed for relevance. During this check, another 114 articles were deleted from our set because the article did not focus on the intrapreneurial employee. In the end, 106 articles were used for in-depth analysis. Figure 1 summarizes the selection process. The in-depth analysis of these 106 articles was used to design an integrated model of intrapreneurship and to develop a research agenda. The set of 106 articles was analyzed. We summarized each article and created a spreadsheet to organize the information. The first article in our set was published in 1989. The number of publications in this field increased from 2002 onwards (Fig. 2). This indicates that interest in employee intrapreneurship has grown in recent years. The selected articles were published in 73 different journals. Of these, 15 journals published 2 or more articles in this field. International Entrepreneurship and Management Journal (8) and Journal of Business Venturing (6) were the journals that published most articles about the intrapreneurial employee (Table 1). From a methodology point of view, the articles were divided into qualitative and quantitative research. Most studies used a quantitative method (84 articles). In these studies, the most frequently used method was questionnaire research, sometimes using an existing database. Twenty-two articles described qualitative research. To answer the question “What is the definition of intrapreneurship related to the individual employee?”, the definitions used in the selected articles were extracted and reviewed. From this analysis we concluded that the terms ‘intrapreneurship’ and ‘corporate entrepreneurship’ are the main ones used in the literature. Both terms are used in definitions that emphasize the individual or the organization. It seems that the definitions of intrapreneurship did not always concentrate on the employee. In fact, 37 of the 73 definitions regarded intrapreneurship or corporate entrepreneurship from the organizational point of view. They revolve around the creation of new businesses, products and ventures. For example, Fischer (2011) describes corporate entrepreneurship as: ‘a process of corporate renewal in established firms. The goal of this process is to increase profitability, to enable strategic renewal and to foster innovativeness’. It was also described as ‘the activities of an organization to enhance innovations, risk-taking and proactive responses to forces from the environment’ (Jaen and Linan 2013). From the 73 different descriptions, only 36 descriptions incorporated the individual employee. In other words, the behaviors and actions of individual employees are described in these definitions. From this point of view intrapreneurship is defined as: ‘a process by which individuals inside an organization undertake new activities and depart from routines to pursue new opportunities’ (Garcia-Morales et al. 2014; Halme et al. 2012) or as ‘bottom-up proactive work-related initiatives of individual employees that are the driving force behind product development or improvement and/or market penetration’ (Moriano et al. 2014). Regardless of whether the definition was individually based or organizationally based, the themes that were used to describe intrapreneurship were similar. In general, we found that the definitions revolve around one or more of the following six themes: (1) innovativeness and creation of new products/processes/services, (2) new business venturing, (3) self-renewal of the organization, (4) opportunity recognition and exploitation, (5) proactiveness and (6) risk-taking. Table 2 provides an overview of the themes and the number of times these themes were mentioned in the definitions, divided into organizational-focused definitions and individual-focused definition. We found no definition that included all six characteristics of intrapreneurship. It is worth mentioning that we found a seventh theme. A few definitions of intrapreneurship mentioned that intrapreneurs behave in a way that deviates from the existing practices within the organization. This theme was reflected in 7 different definitions. For instance, Berzin et al. (2016) described intrapreneurship as ‘The process of entrepreneurship within an existing organizational structure and speaks of intentions and behaviors that are distinct from traditional practice’. Another author describes it as the entrepreneurial efforts of employees because they lack authority and power (Heinze and Weber 2016). This reflects that intrapreneurship could also be initiated through a bottom-up approach. No definition was used more than other definitions. Intrapreneurship is a process whereby employee(s) recognize and exploit opportunities by being innovative, proactive and by taking risks, in order for the organization to create new products, processes and services, initiate self-renewal or venture new businesses to enhance the competitiveness and performance of the organization. This new definition includes all the different themes that were used in other definitions. These themes could be divided into two groups. It could be argued that the first three themes (new product/innovation, new business venturing and self-renewal) are goals of intrapreneurship, while the remaining three (opportunity recognition and exploitation, proactiveness and risk-taking) are characteristics of intrapreneurship. In this definition, intrapreneurship is therefore operationalized as a process, in line with Berzin et al. (2016), Fischer (2011), Garcia-Morales et al. (2014) and Halme et al. (2012). The rationale behind this is that intrapreneurship is not merely a behavior of an individual or an organization, but is about a set of activities of an individual or an organization to get from point A to point B in time, with an increased competitiveness and performance of the organization as the end goal. One of the research questions of this literature review is: “What are the characteristics, attitudes and behaviors typifying an intrapreneurial employee?” For each category (attitudes, behavior and characteristics), analysis revealed a top four or five of dimensions related to the intrapreneurial employee (Table 3). We first discuss the behavioral dimensions of an intrapreneur. Next, we discuss the determinants (attitudes and characteristics) of intrapreneurship, followed by the intrapreneurial outcomes of the behavior. The determinants of intrapreneurship are structured using the TPB (Ajzen 1991). We end our thematic results with an analysis of the conditions in which intrapreneurs act, in other words, the organizational factors inhibiting or facilitating intrapreneurship. Articles that investigated the behavior of the intrapreneur mostly concentrated on these dimensions: innovativeness/creativeness, proactiveness, opportunity recognition and exploitation, risk-taking and networking. These behavioral dimensions seem to be consistent with behaviors offered in the definition of intrapreneurship. To create a new invention, whether a new product, process or a new organization, a person must be able to recognize opportunities and use resources and knowledge to actively exploit these opportunities (Baczynska et al. 2016; Urbano and Turro 2013). Sebora and Theerapatvong (2010) found that managers take more risks and are more innovative and more proactive when the organization supports intrapreneurial managers. They also found that the proactiveness of the manager is positively associated with the entrepreneurial climate within the organization. Fellnhofer et al. 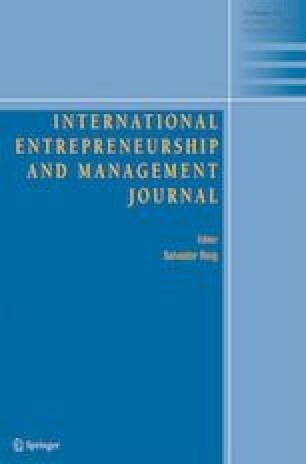 (2016) related individual intrapreneurial behaviors with the work performance of female and male employees and with the level of entrepreneurship of the organization. The intrapreneur needs to be proactive toward the market as well as internally within the organization to ensure that the organization follows up on opportunities and innovations. For instance, Maritz (2010) found that there is a significant relationship between networking with other research organizations and the level of entrepreneurship of a university. Razavi and Ab Aziz (2017) also indicated that networking, in addition to innovativeness, proactiveness and risk-taking, is an important factor in the intention to be intrapreneurial. Networking seems to be an important factor distinguishing intrapreneurs from entrepreneurs, in that intrapreneurs must act within an organization with a certain climate and political field (Smith et al. 2016). A study by Baggen et al. (2016) investigated the relationship between entrepreneurial employee activities, which was expressed as how often the employees were involve in innovation-related activities, and opportunity identification competence. They found a positive association. They also found that self-perceived creative self-efficacy influences opportunity recognition. Regarding the attitudes of the intrapreneur, we found that the relationship with the organization is the most investigated factor within our set of articles. This relation includes aspects of commitment to the organization and intention to quit. Research indicates that perceptions of innovativeness, proactiveness and risk-taking of the organization have a positive relation with organizational commitment (Giannikis and Nikandrou 2013; Rutherford and Holt 2007). Farruck, Chong, Mansori and Ramzani (2017) investigated the relationship between commitment and intrapreneurial behavior. They found that affective and normative commitment had a positive relation with commitment, while continuance commitment was negatively related to intrapreneurial behavior. Identification with the organization, i.e., feelings of belongingness to the organization, is positively related to the intrapreneurial behavior of employees. Identification with the organization also serves as a partial mediator between leadership and intrapreneurial behavior (Valsania et al. 2016). In addition to the relationship with the organization, the satisfaction of an employee with his/her job is important in intrapreneurship literature. Job satisfaction has a positive association with intrapreneurship of the organization (Antoncic and Antoncic 2011; Giannikis and Nikandrou 2013). Rutherford and Holt (2007) found a mediating effect of satisfaction between intrapreneurship of the organization and performance. A direct relationship between satisfaction and a behavioral dimension found in this review is between the satisfaction and activities of the employee regarding the selling of his/her idea within the organization (De Clercq et al. 2011). Job satisfaction is found to be a partial mediator between psychological ownership and intrapreneurial behavior (Mustafa et al. 2016b). Motivation and the intention to act intrapreneurially are also important attitudinal dimensions in relation to intrapreneurship. We found a number of characteristics that describe the intrapreneurial employee. One of them is the perception that employees have about themselves. This perception is often referred to as self-efficacy, which is an individuals’ belief that he or she is capable of successfully performing a certain task (Wang et al. 2013). It is an intrapreneurial characteristic that is often referred to in the literature. A relation is found between self-efficacy and intrapreneurship. Entrepreneurial behavior, opportunity recognition, and product performance are higher when the employee has more self-efficacy (Rutherford and Holt 2007; Simon et al. 2002; Urbano et al. 2013; Wakkee et al. 2010; Zampetakis et al. 2009). Higher self-efficacy also leads to a higher intention to act entrepreneurially (Douglas and Fitzsimmons 2013; Hanson 2017), which is one of the attitudes of the intrapreneur found in this systematic literature review. Along with self-efficacy, past experience and personal knowledge are related to intrapreneurship. For instance, Urbano et al. (2013) and Guerrero and Pena-Legazkue (2013) found that past entrepreneurial experience of the employee resulted in high levels of intrapreneurial activities and corporate venturing. In addition, knowledge derived from prior experiences improves the recognition of opportunities (Wang et al. 2013). Personal knowledge, classified as knowledge derived from education and training, is related with the probability of becoming an intrapreneur. Martiarena (2013) and Urbano and Turro (2013) both found that intrapreneurs have a higher educational level in comparison to other employees, or they have participated in training about intrapreneurship. Furthermore, Alrumaithi et al. (2015) found that intrapreneurial training results in a higher number of spin-offs. A final category of characteristics of an intrapreneurial employee is related to personal skills and abilities. We found several skills and abilities mentioned in the literature; however, there was not one skill that was more prevalent in the literature than others. Examples include the social skills and teamwork skills of an individual (Avkiran 2000; Van Dam et al. 2010). Moreover, the ability to be persistent and show endurance seems to be important to develop and implement new ideas (Davis 1999; Sundin and Tillmar 2008). To investigate the outcomes of intrapreneurial behavior, we reviewed the articles in our dataset. From the 106 different articles, 20 articles study outcomes of individual intrapreneurial behavior. Examples of these outcome variables are innovation, business renewal, organizational performance and individual success (e.g., Baggen et al. 2016; Rigtering and Weitzel 2013; Sundin and Tillmar 2008). The outcome variables that we used more than once in our data set are listed in Table 4. Most of these variables were measured on an individual level (11). For instance, they measured participation in a project or starting a venture by asking the participants if they are currently trying to set up a venture or have been involved in the development of projects (Urbano and Turro 2013; Urbano et al. 2013). Another example is from Baggen et al. (2016), who investigated the relationship between entrepreneurial employee activity and the number of ideas of the participant adopted by management. Four of them were organizational-level variables. An example of this is the measurement of company performance by asking the respondents to rate their organization’s performance (growth, sales, etc.) in relation to other organizations. Only three were based on team performance. All of this research focused on either individual intrapreneurial outcomes or organizational outcomes. None of them made the connection between individual outcomes and organizational outcomes. These results show that the link between individual intrapreneurial behavior and the outcomes of this behavior has not yet been researched in depth. Still, these results do show that the intrapreneurial outcomes reflected in the different definitions of intrapreneurship (new product/innovation, new business venturing and self-renewal) are, albeit limited, also used in research. The success of the intrapreneur also depends on the organizational context. The organization can facilitate or inhibit the actions of the intrapreneur. In our systematic literature review, we found that the majority of articles focused on organizational factors influencing intrapreneurship. The top five antecedents found in the literature are listed in Table 5. Receiving management support is very important to the employees willing to undertake intrapreneurial activities. Management support refers to the willingness of management to facilitate and promote intrapreneurship (Marvel et al. 2007; Sebora et al. 2010), including encouraging employees and recognizing that their activities involve some risk-taking (Kelley and Lee 2010; Kuratko et al. 1990), and creating a norm within the organization (Garcia-Morales et al. 2014). The organizational structure dimension refers to the flexibility of the organization, the flow of information throughout the organization and the centralization of the decision-making (Van Wyk and Adonisi 2008; Zur and Walega 2015). Open channels of communication and providing mechanisms that allow for ideas to be evaluated, selected and implemented are positively related to intrapreneurship (Castrogiovanni et al. 2011; Marvel et al. 2007). The level of this formalization is found to be positively related to job satisfaction and self-efficacy (Duygulu and Kurgun 2009; Globocnik and Salomo 2015). However, Kuratko and Montagno (1989) mentioned that many rules and procedures may also inhibit intrapreneurship. Work discretion and giving employees autonomy in their work is one of the other dimensions that influence the intrapreneur. Giving the employee the freedom to design his/her work and to decentralize the decision-making process results in more intrapreneurial activities (Sebora et al. 2010; Meynhardt and Diefenbach 2012). It also increases the self-efficacy of employees (Globocnik and Salomo 2015). Rewards and reinforcement is the fourth dimension in the top five of antecedents related to intrapreneurship. Rewards should be in line with goals and should be based on results (Marvel et al. 2007; Sebora et al. 2010). Rewards increase the willingness of an employee to participate in innovative projects (Monsen et al. 2010; Urban and Nikolov 2013). A reward is also a predictor of job satisfaction (Van Wyk and Adonisi 2008) and it increases commitment (Brazeal 1993). Furthermore, in addition to management support, organizational structure, autonomy and rewards/reinforcements, providing the right resources is influential. These resources involve time and financial resources. Puech and Durand (2017) researched what how long intrapreneurs needed to become intrapreneurs. They found that the quality of time is more important than the actual amount of time, especially during the exploration phase in which it is not always clear what activities the intrapreneur should undertake. Other antecedents outside the top five include, for instance, the tolerance of failure from the organization’s point of view and the climate within the organization. All concepts mentioned in our dataset were analyzed and categorized into behaviors, attitudes and characteristics. The top four or five of each category have been discussed above. Based on the theory of planned behavior (Ajzen 1991), we consider attitudes and characteristics as antecedents of behavior. This categorization is reflected in the proposed framework shown in Fig. 3. The results of the definition analysis indicate that intrapreneurship is defined from an organizational perspective and an individual perspective. In this framework, both perspectives are included to show the multilevel nature of intrapreneurship. This framework also reflects the way our definition of intrapreneurship is constructed. We define intrapreneurship as a bottom-up process whereby employee(s) recognize and exploit opportunities by being innovative, proactive and by taking risks, in order for the organization to create new products, processes and services, initiate self-renewal or venture new businesses to enhance the competitiveness and performance of the organization. The first part of this definition (“employee(s) recognize … by taking risks”) reflects the aspects of the intrapreneurial employee. It incorporates the behaviors, attitudes and characteristics related to the intrapreneurship of individual employees. Some researchers focus on the relation between a certain attitude and intrapreneurship (Antoncic and Antoncic 2011; Giannikis and Nikandrou 2013; Rutherford and Holt 2007), some on the relation between behavior and intrapreneurship (Garcia-Morales et al. 2014; Urbano et al. 2013); however, how the intrapreneurial behaviors, attitudes and characteristics relate with each other is often overlooked. From the analysis of the definitions found in our review, we know that intrapreneurship is often related to innovativeness, proactiveness and risk-taking of the organization itself. In other words, the organization behaves as an intrapreneurial organization. For an organization to behave like this, employees should also exhibit these behaviors. Thus, we conclude that when individual employees are intrapreneurial, this leads to intrapreneurial outcomes at the organizational level, such as self-renewal and new products. The relationship between individual behavior and organizational results shows the interconnectedness of the intrapreneur with the organization. An intrapreneur is always part of the organization and its structure. The important aspect is that all actions of the intrapreneur should first of all benefit the organization and indirectly also the intrapreneur. This is reflected in the second part of the definition (“in order for the … new businesses”). The third part of the definition (“to enhance … the organization”) is described in this framework as organizational performance. The organizational performance outcomes of intrapreneurship mentioned in the articles are related to firm performance, either in terms of revenue, growth, innovative products, successful sustainable efforts or new values creation. As the focus of this review is on the intrapreneurial individual, we noticed that the relationship between intrapreneurial outcomes and organizational performance is usually only stated implicitly and not explicitly. As mentioned earlier, the organization can be considered an inhibitor or a facilitator of individual intrapreneurial behavior. The organization can provide resources and knowledge. It can support the intrapreneur in providing a recognition of intrapreneurship and the permission to act intrapreneurially. The organization can also inhibit intrapreneurial actions, which makes it more difficult for the intrapreneur to act. However, as we have seen in certain definitions, the intrapreneur can also act against the standard practices and take those risks associated with it (Berzin et al. 2016; Heinze and Weber 2016). Therefore, organizational factors can be a moderator in a relationship between the actions of the intrapreneurial employee and intrapreneurial outcomes and are thus included in the proposed framework as well. This systematic literature review revealed the characteristics, attitudes and behaviors of the intrapreneurial employee, as well as those organizational factors that inhibit or facilitate the employee to act intrapreneurially. These results were used to construct an integrative model of the intrapreneurial employee. Future research should contribute to testing this model. Based on our SLR, we suggest the following research agenda, which provides subjects and questions for future research projects. We discuss the research directions based on the substantive findings, followed by the research directions based on the methodological findings. First, we encourage researchers to explore the relationships among the factors identified in our model. The model provides a useful overview of the issues that could be addressed in an explorative study. We found from our analysis of the definition and our review of the factors that intrapreneurship is a multilevel construct. It would be interesting to examine the link between individual intrapreneurial behavior and the intrapreneurial outcomes. From our definition analysis, we found that this link is part of the entire construct of intrapreneurship, but we found no research that explicitly investigates the process of how the behavior of the individual leads to intrapreneurial outcomes on an individual level and subsequently on an organizational level, even though the relationship between the intrapreneur and the organization is what makes an intrapreneur an intrapreneur. From previous research, we know that the organization-level measurement of entrepreneurial orientation is often related to organizational performance (Covin et al. 2006; Wiklund and Shepherd 2005). The articles in our dataset either investigated the relationship between individual intrapreneurial behavior and individual performance, or between individual behavior and organizational performance, but not the aggregation from individual behavior, individual output and organizational performance. Investigating this process would lead to a better understanding of the construct of intrapreneurship and how the processes within an organization could influence the emergence of intrapreneurial activities. Second, future research may investigate the conditions under which the intrapreneurial determinants, such as the attitudes and characteristics of the employee, influence intrapreneurial behavior or how the organizational factors moderate the emergence of this intrapreneurial behavior. Related to these factors, we noticed that the organizational factors that influence the intrapreneur are mostly job resources. These resources reduce the costs associated with work and should balance the demands of a job (Demerouti et al. 2001). However, we found no articles related to job demands, such as uncertainty and stress, in relation to intrapreneurship. These job demands could possibly inhibit the effect of intrapreneurship. This could be a worthwhile future research direction. Third, we found that in current quantitative studies the relationships between factors influencing individual intrapreneurship are not always clear. The theory of planned behavior (TPB) (Ajzen 1991) could, for example, be used to connect the factors of intrapreneurship found in the literature review. TPB states that attitudes, subjective norms and perceived behavioral control influence one’s level of intention to behave in a certain way. From this point of view and with our literature review in mind, we argue that the intrapreneurial attitudes ‘motivation’, ‘satisfaction’ and ‘relationship with the organization’ may influence the amount of intention someone has to act intrapreneurially. The relationship between motivation, satisfaction and commitment to someone’s intention was not investigated in any of the reviewed studies; however, these attitudes were linked with intrapreneurship at an organizational level (Antoncic and Antoncic 2011; Giannikis and Nikandrou 2013; Rutherford and Holt 2007). The second component within the TPB that influences the intention of a person is the subjective norm. The subjective norm is related to the person’s perception of the social pressures to act a certain way (Ajzen 1991; Jaen and Linan 2013). Although the climate within the organization is not one of the top five factors influencing the employee, it was found to have an influence (Van Dam et al. 2010; Zhang and Jia 2010). The last component preceding the intention of an individual according to the theory of planned behavior is perceived behavioral control. This is the person’s perception of his/her ability to perform a behavior (Ajzen 1991; Jaen and Linan 2013). The characteristics of the intrapreneurial employee – self-efficacy, past experience and personal knowledge – can be regarded as related to the person’s perception of their ability. The theory of planned behavior states that the actual behavior of an individual is predicted by the intention that person has to perform the behavior (Ajzen 1991). In this review we found that the intrapreneurial intention of an employee has a positive influence on the amount of intrapreneurial activities that are developed by that employee (Urbano et al. 2013). We recommend that future research study these relationships. The theory of planned behavior could be useful for modeling the individual factors within the integrative framework we constructed based on this review. However, other theories may also be suitable. Future research may want to construct a measurement tool that assesses the level of intrapreneurship of the individual employee. Some researchers already combined the three behaviors – innovativeness, proactiveness and risk-taking – in one measurement scale (Moriano et al. 2014). However, as we can conclude from our review, these three behaviors alone are not enough to measure the intrapreneurship of the employee. Other behaviors, such as opportunity recognition and networking, and other characteristics and attitudes should also be included. In addition to the inclusion of other behaviors, it should be determined to what level these behaviors correlate. When is an employee intrapreneurial? Is the combination of these underlying behaviors necessary for intrapreneurship, or could a high score on one type of behavior compensate for a low score on another type of behavior? Future research should therefore focus on the underlying behaviors and how they interact. The focus of the measurement tool should be on the individual employee and not as much on the organizational factors influencing the employee. Our analysis found that organizational factors are already incorporated into a measurement tool called the Corporate Entrepreneurship Assessment Instrument (CEAI), a measurement instrument constructed by (Hornsby et al. 2002). Developing an extended instrument, in which individual and organizational factors are incorporated, would be useful for organizations to investigate the level of intrapreneurship of employees and to adapt their policies to the results. Until now most studies have treated employees as a homogenous group. However, it may be that for some groups of employees, intrapreneurship is more important than for others. The function of an employee might be a factor that influences the intrapreneurial behavior of this employee. Some functions are crafted in a way that might make it easy for an employee to be intrapreneurial, while other functions are not. In addition, an employee’s role might change due to a changing context. For example, recent socio-economic trends point toward the importance of sustainability. Within the context of sustainability, the role of purchasers is changing. They should become more like intrapreneurs to address the increasing call for ‘green’ products and services. However, their traditional way of working is not intrapreneurial (Crespin-Mazet and Dontenwill 2012). Within this SLR, there only one study investigated supply managers and only one investigated intrapreneurship in relation to sustainability (Brinkhurst et al. 2011; Steward et al. 2010). This indicates that there is a gap between our knowledge about intrapreneurial employees and intrapreneurship within specific functions and context. Are intrapreneurial employees/purchasers better equipped to enact green initiatives? Future research needs to investigate this knowledge gap. As stated earlier, intrapreneurship is a multilevel construct (Antoncic and Hisrich 2003; Hayton and Kelley 2006; Kuratko et al. 2005). It could be argued that individual intention and individual behavior are steps that precede organizational-level intrapreneurship (Ajzen 1991; Fellnhofer et al. 2016; Rigtering and Weitzel 2013). There is a lack of multilevel research addressing the organizational-level factors that influence employee intrapreneurial behavior and that investigate how individual intrapreneurial behavior influences outcomes at an organizational level. This is important to know for strategic purposes. When organizations are aware of the process of how individual intrapreneurial behavior leads to organizational outcomes, then the organizations can take action to stimulate that process. Factors such as leadership and team dynamics might be important in this process. How does the intrapreneur fit within the team and influence his or her colleagues? What is the influence of the team’s composition? In other words, how and when does individual intrapreneurial behavior impact organizational-level outcomes? Future research should therefore address this multilevel character of intrapreneurship. Future research may want to use different types of methodologies to study intrapreneurship. The majority of the studies were quantitative ones based on questionnaires, usually administered only once. Future research could include more longitudinal research, enabling the researcher to study changes in time and the effects of possible interventions. Moreover, different types of data collection, other than questionnaires, could be used to investigate intrapreneurship. For example, it would be interesting to perform in-depth case studies to analyze the multilevel nature of intrapreneurship. This research focused on the intrapreneurial employee. Via a systematic literature review we constructed an integrated framework that integrates the definition, dimensions, antecedents and determinants of intrapreneurship. It also integrates the organizational factors that influence the employee. Based on an analysis of the different definitions of intrapreneurship found in the literature, we also proposed a new definition that includes the different aspects of intrapreneurship and does reflect the importance of the multilevel nature of intrapreneurship. This review confirms the strategic importance of intrapreneurship. It shows the multilevel nature of intrapreneurship by emphasizing the link between individual intrapreneurial behavior and organizational outcomes, thus implying that employees do have a direct impact on the organization’s strategic direction (Alt and Craig 2016; Hart 1992; Heinze and Weber 2016; Peters and Waterman 1982). It also reflects that an intrapreneur acts within the constraints of an organization, constraints that could be beneficial or detrimental to the behavior and attitudes of the intrapreneur. Our SLR contributes to current academic knowledge in the following ways. This research shows that intrapreneurship is a complex, multilevel construct. The intrapreneur is not a single actor within the environment, but acts as part of an organization and will thus be influenced by it. In addition to individual characteristics and behavior, it is important to take into account the relationship with the organization and other attitudes. This research also shows that it is not sufficient to focus only on the behavioral aspects of innovativeness, proactiveness and risk-taking when researching the employee. Intrapreneurship is a broader construct and should also include opportunity recognition/exploitation, networking, and perception of employees’ own capabilities, skills, knowledge and past experience. Our study is subject to some limitations. First, we used articles published in ISI-certified journals. This was done to ensure the quality of the articles used; however, it is possible that we missed good-quality articles that were not published in ISI journals. This also applies to articles written in languages other than English. Some additional insights may have been gained from these articles. However, we strongly feel that the number of articles included in our review is sufficient to support our conclusions. Second, the search terms were mostly synonyms for the term ‘intrapreneurship’. This resulted in numerous articles that were related to the organization and not related to the individual employee. These articles were excluded from the abstract analysis. However, it could be argued that some information about individual factors and organizational factors related to intrapreneurial employees was lost during this selection process. We feel that this selection decision was necessary to focus our research. Despite these limitations, our overview of the literature on the intrapreneurial employee could serve as a solid basis for further research into intrapreneurship.